We strive to develop the whole child by fostering academic excellence along with strong character education. Our faculty creates a secure, structured, and respectful environment to give students the opportunity to stretch beyond their comfort zones, develop new interests, and form relationships with fellow students and teachers. 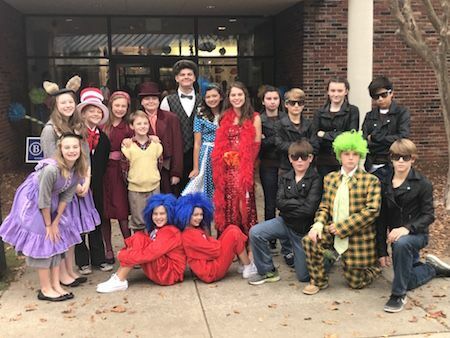 Brookstone Middle School welcomes the chal­lenge of helping students grow and find success during the transitional years of pre-adoles­cence. Throughout the three year program, students are challenged to succeed academi­cally, to develop social skills and strong quali­ties of leadership, to appreciate the worth and dignity of others, to value personal honesty and character, and to understand the value of service to others. Brookstone Middle School is a 1:1 technology school to supplement and enhance each student’s educational experience. In addition to English, grammar, math, science, social studies, and world languages, middle school students take physical education daily and choose from elec­tives including band, chorus, piano, drama, speech, computer, and art. Leadership and character education are also an important part of the middle school curriculum. Programs such as Cougar Ambas­sadors, Prides, and the Pride Council provide students leadership and service opportunities, while the WEB program (Where Everyone Belongs), Girl Talk, and Mentoring Men focus on character development.